Defence and aerospace group BAE Systems has described a report that it is to sell its 20% stake in Airbus later this week as "premature". BAE first announced in April that it was thinking of withdrawing from the pan-European aircraft-maker. 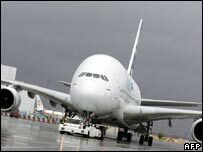 The buyer of its share is expected to be EADS, the Franco-German group which owns the remaining 80% stake in Airbus. UK-based BAE said it could not make any decision on the sale until it had completed its own audit of Airbus. Its comments came after the Observer said BAE was now ready to sell its shares in Airbus, despite being unhappy with an independent valuation calculating the worth of its stake at £1.9bn. According to widespread reports over recent months, UK-based BAE had been hoping to get significantly more for its Airbus stake. Unfortunately for BAE, since it first announced it was thinking of selling its share in April, Airbus has been rocked by delays to the development of its new Airbus A380 super-jumbo. The £1.9bn valuation was independently calculated by investment bank Rothschild. The Observer said that BAE was now ready to accept a price near £1.9bn, as it thinks things will only get worse at Airbus before they are turned around. "We said in July the audit would take six or seven weeks, but it is premature and pure speculation to say what the content of that will be - or a potential value," said a BAE spokeswoman. Airbus employs 13,000 people in the UK, where it designs and builds the wings for its planes across two main sites - Broughton in North Wales and Filton near Bristol.